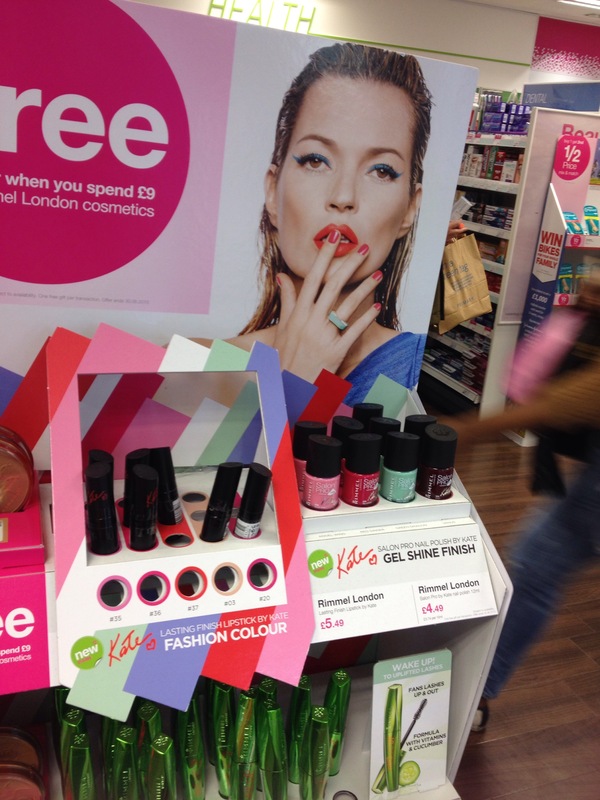 Another quick stopped update for you – new display stands are being whipped into stores up and down the country! 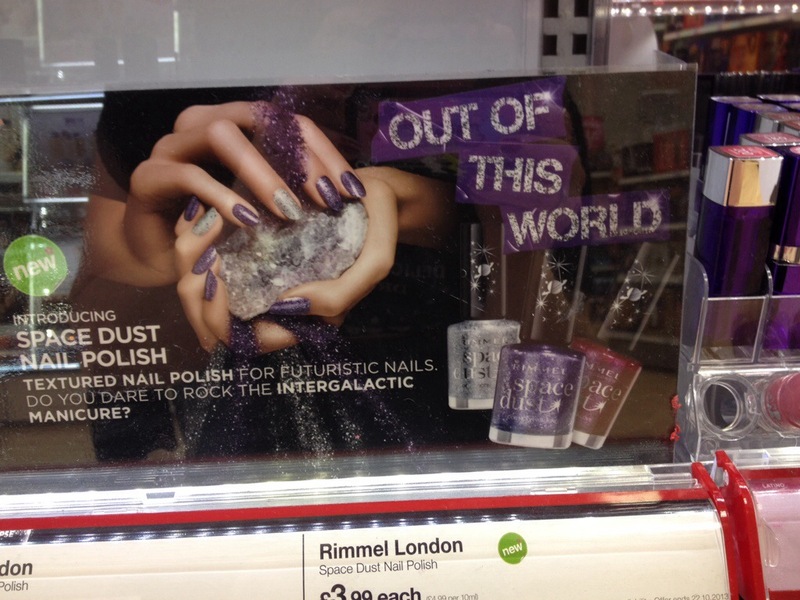 I have to admit I’m not 100% sure these are new shades as I know Venus was a release earlier this year…. 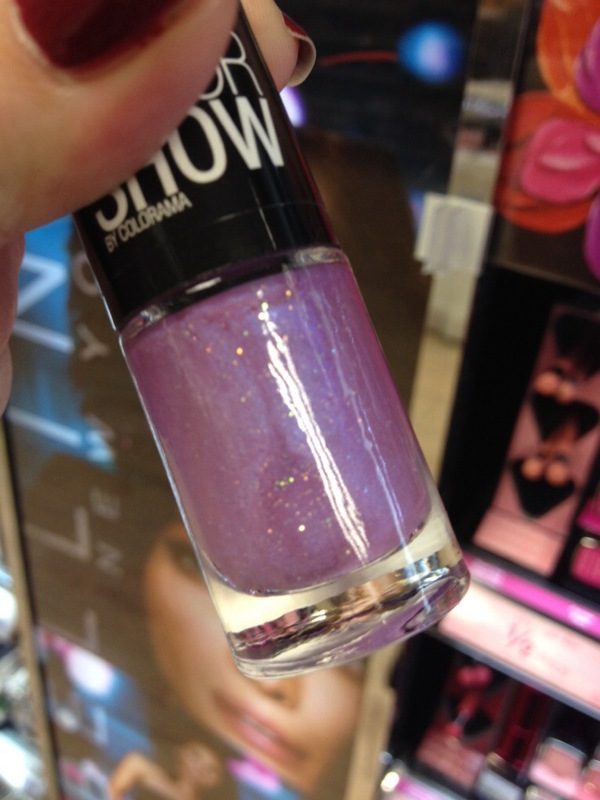 Maybe its the more summery shades that are new… who knows! But exciting with new stands, come new offers. I can’t remember what this one is, but you get something free when you spend £9…. I think I’ve gone a bit orange cray cray… but it is getting warmer out there and so I think I can let myself get away with this. 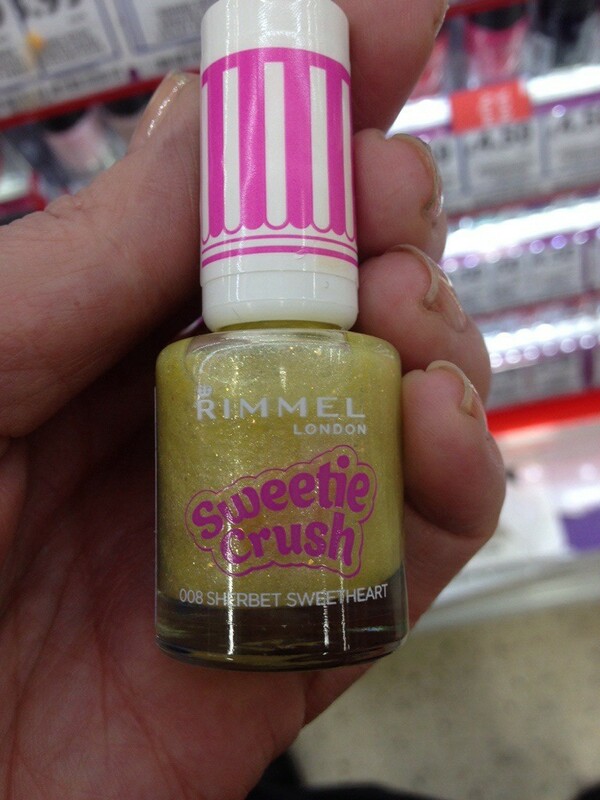 I picked this up with some other cosmetics in a 3 for 2 in Superdrug. I figured it was worth a try. So lets check out some pictures! Despite the slightly ridiculous festival style name, Tangerine Tent is the perfect juicy orange shade. Its bright and happy. What you see above is two easy coats over a base of Nailtiques 2. I did use a top coat here, my Nails Inc Kensington Top Coat, but it does dry to a high shine finish. I just wanted to ensure a good wear time so chose to top coat. You could skip this step. I think for a cheap, good quality polish, you can’t go far wrong here. Formula is easy to work with and it does dry on the quick side. There is a good range of colours and the little flower detail on the cap is cute and so you know if the shade you want is part of the Rita Ora range. Let me know what you think in the comments. Did you pick up any of the Rita Ora Festival Shades? 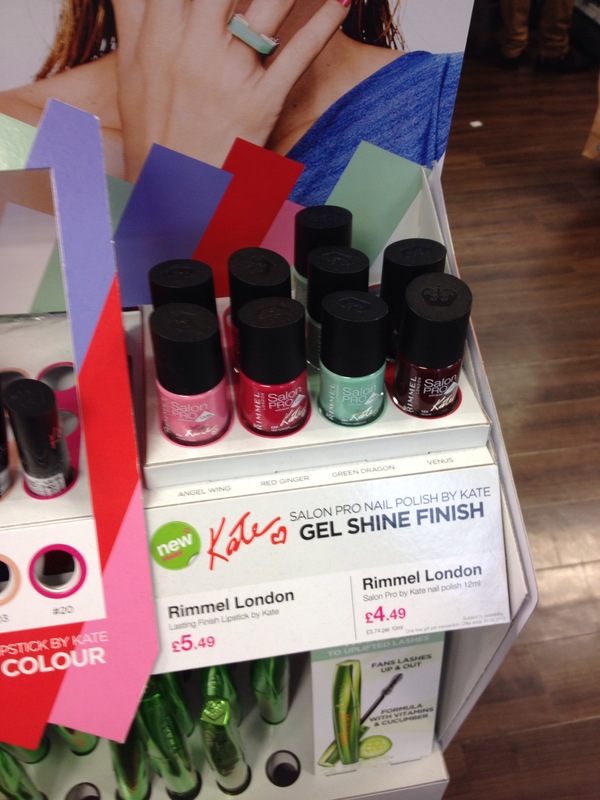 I just happened to pop into my local Superdrug when I spotted new Rita Ora shades for Rimmel London. As you can see below, the new Rita Ora shades have cute flowers on the cap so that you can easily spot them amongst the wider range. According to the website, there are twelve shades in this release. Lets take a closer look….. I also saw this rather large stand on the way out, not sure how I missed it on the way in! 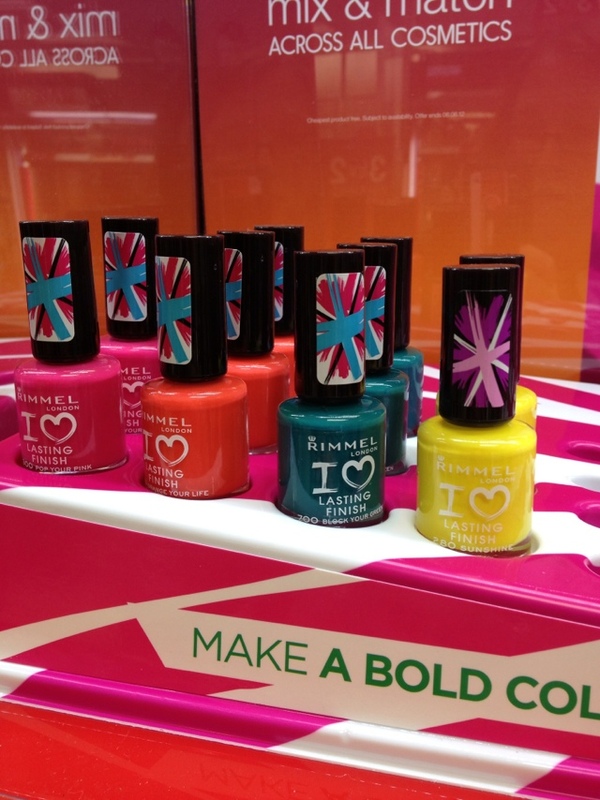 As well as new Rita Ora shades, I also noticed new inserts in the main Rimmel Nail Bar wall. These are Sweetie Heart polishes and appear to have a matte finish, five shades here in shades reminiscent of Swizzle Matlow Love Hearts,. 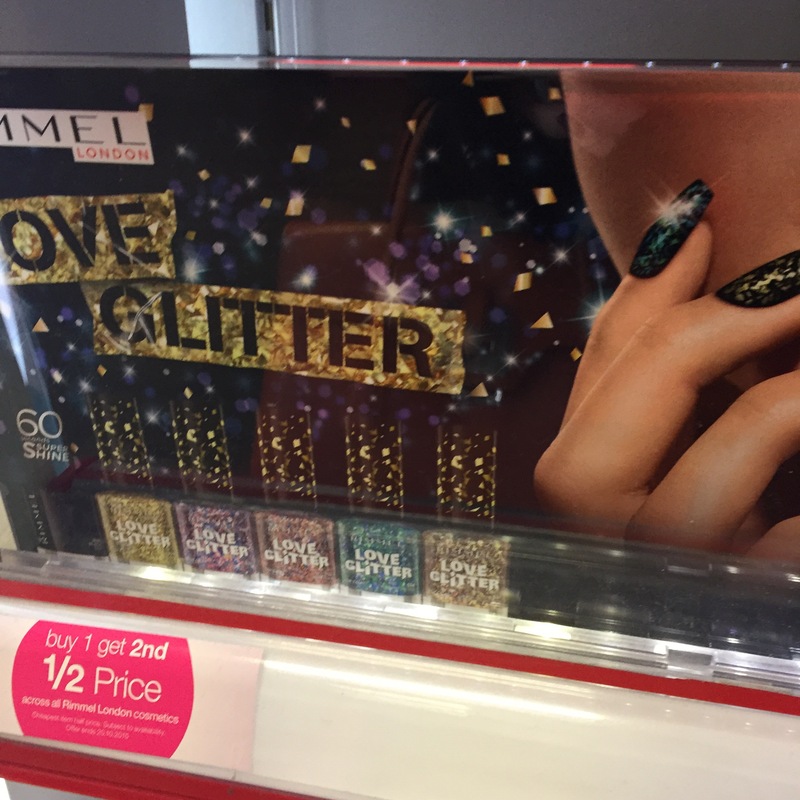 Then, I saw these below the Sweetie Heart shades, another range of five polishes called Pearly Queen (nothing on the Rimmel London website yet) It does look as if the whole 60 Second Line has had a revamp, the bottles look like they have had a facelift, but not sure if that includes a formula re-brand or not. I was with a friend of mine, who bought the mint green 60 seconds polish and she was able to coat her nails twice within 5 mins. They were touch proof within 60 seconds and rock hard in about 4-5mins. Impressive. I’ve not tired them myself yet. Have you? if so, do let me know in the comments. 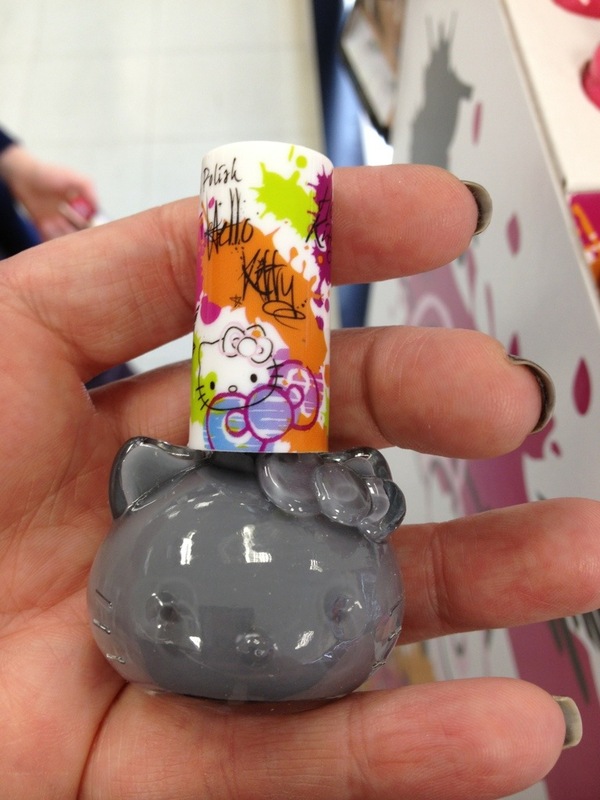 Have you seen these in your local stores yet? Anything catch your eye? 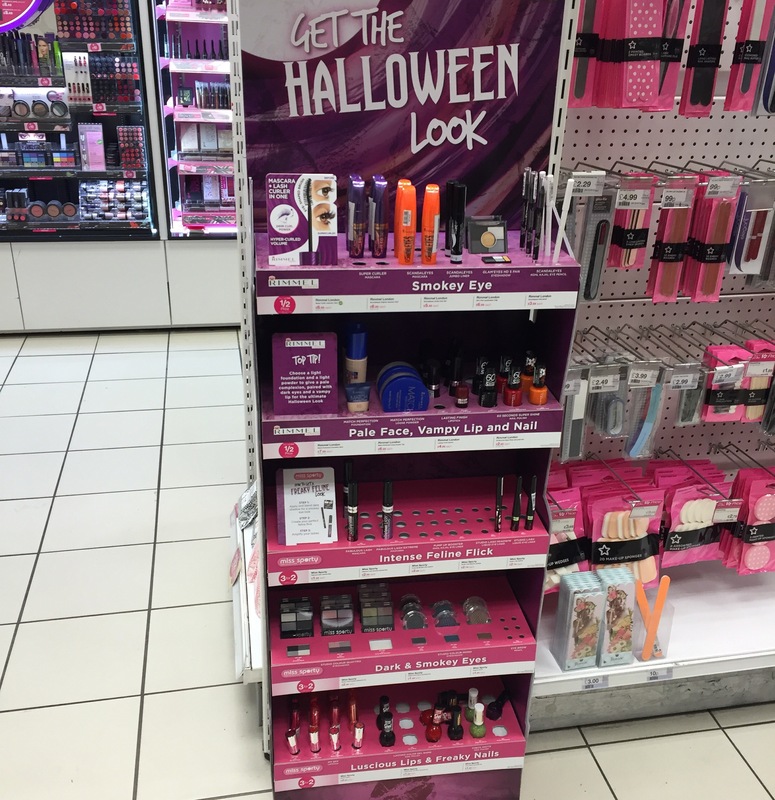 Another quick spot for you today – these I noticed in my local revamped Tesco beauty department. 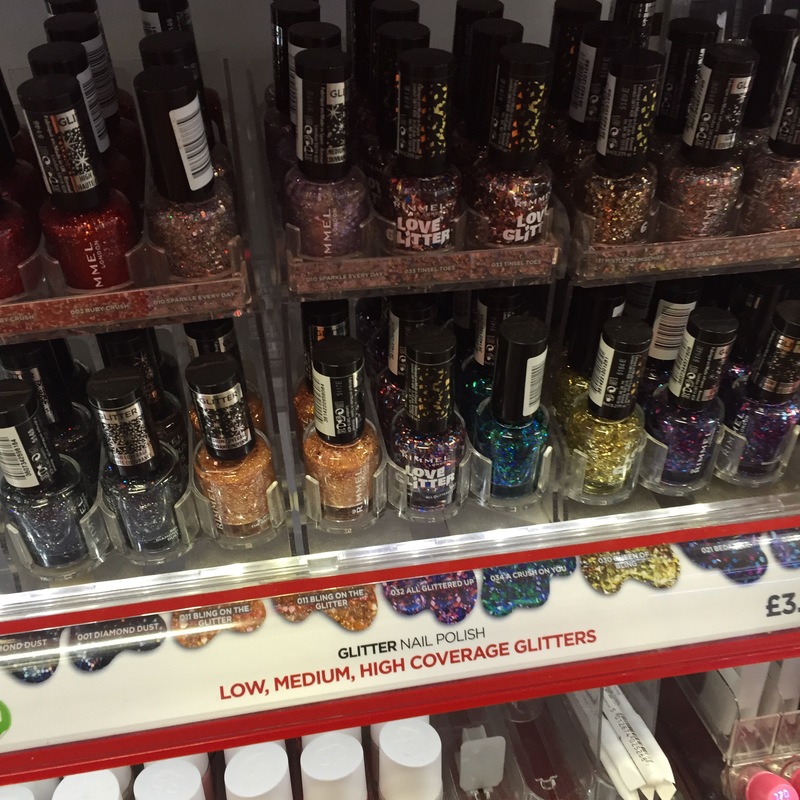 I hear that some also have a HUGE Barry M counter. Not in mine! But look! 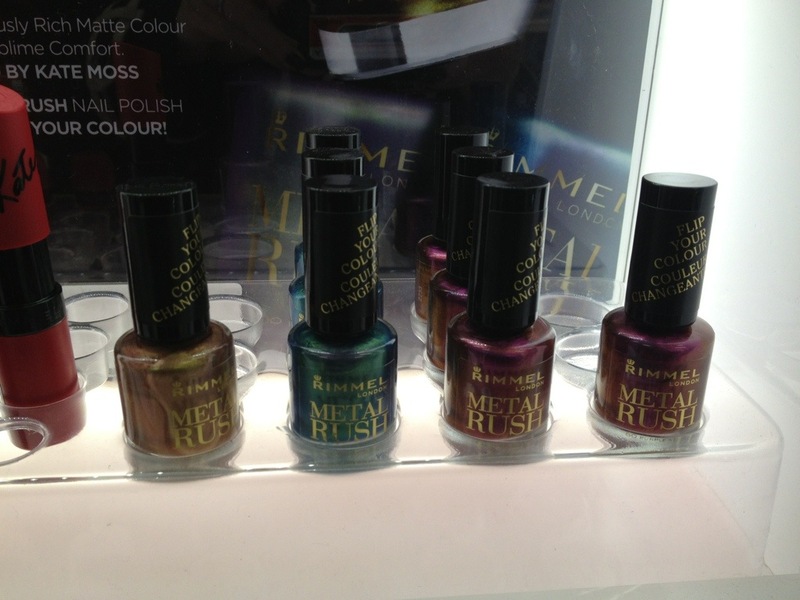 New textured shades from Rimmel London. All with Sweetie sounding names! So what do you think? A hit or a miss? 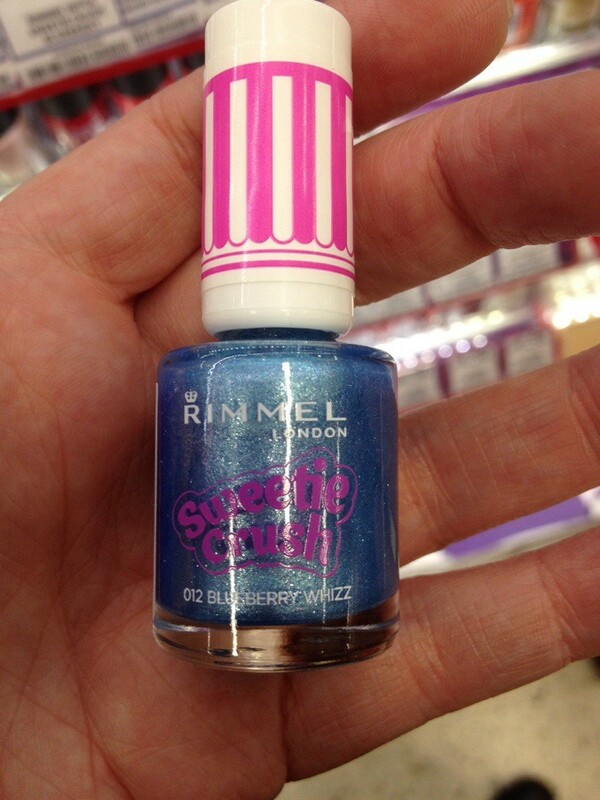 Sweetie Crush polishes are listed on the main Rimmel UK website. They are probably too pale for me and so I left them on the shelf. Let me know if you pick these up – I’d love to hear what they are like! I’ve been out and about this week, looking for new things to show you. Typically its been a bit slow the last couple of days and then BOOM its new products galore. Scroll down to see what is new. 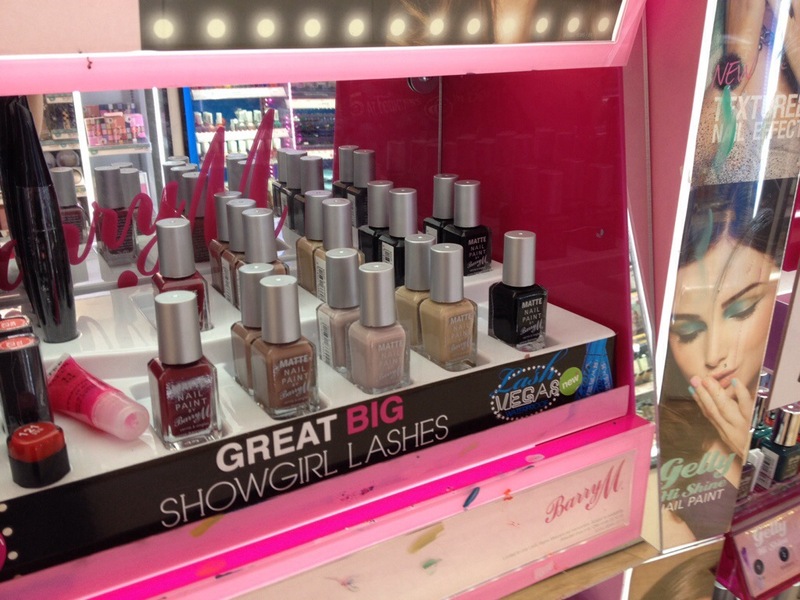 Moving swiftly on, I popped into Superdrug to pick up a few bits and saw this little lovelies. 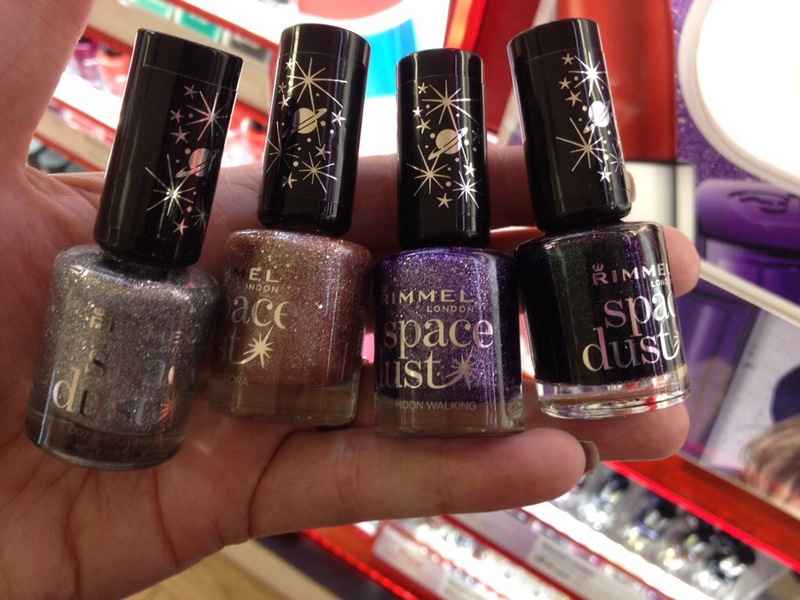 Rimmel Space Dust. This is their take on the textured trend, there seem to be five in the collection. I picked up 004 Total Eclipse, the blackened green you can see on the right. Good price point too at £3.99. 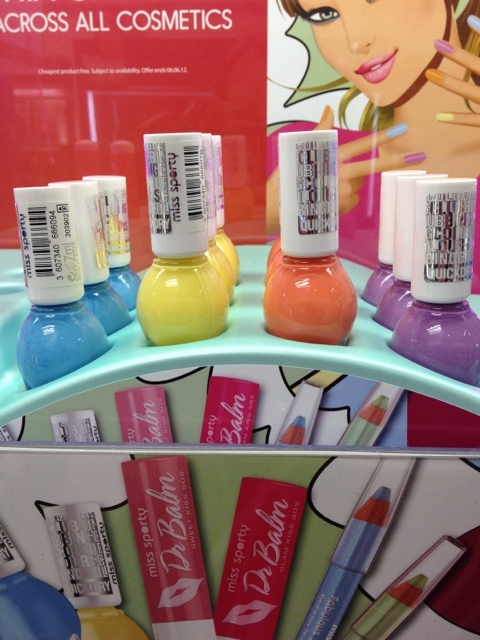 Moving along the cosmetic bays, hoping for those new Color Show Brocade polishes, I notice this new insert into the Maybelline Color Show stand. 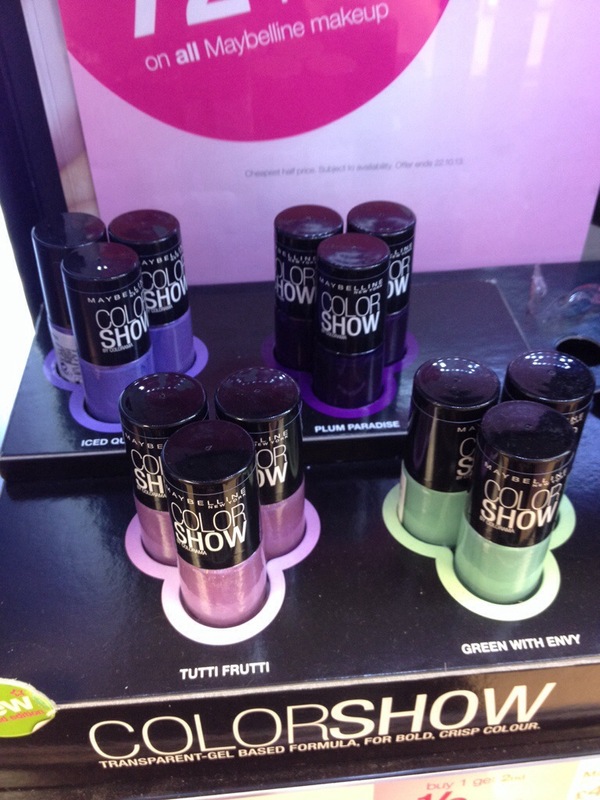 Not sure if these are new shades, but Ice Queen, Plum Paradise, Green with Envy and Tutti Frutti look new to me. Check out Tutti Fruitti in the next picture! Super sparkly, this Tutti Fruitti, looks quite sheer in the bottle ( the runner on the stand does say transparent gel-based formula if I recall correctly that is the whole range…), but I didn’t pick it up, so keep your eye out for swatches. 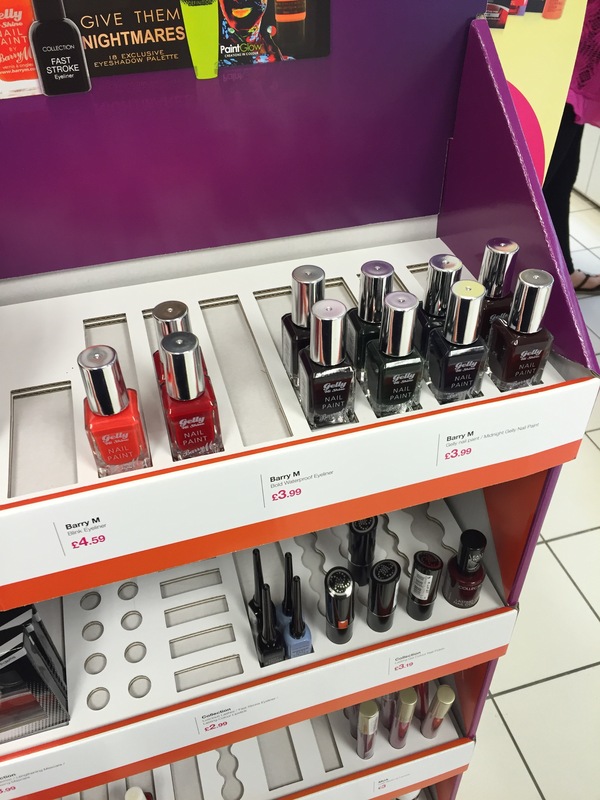 Finally, our local Superdrug has the new Barry M mattes and textures. This does make me happy *sigh* new nail paints in Mushroom and a couple of other colours too, RRP £2.99 and the new Matte and Textures RRP at £3.99. 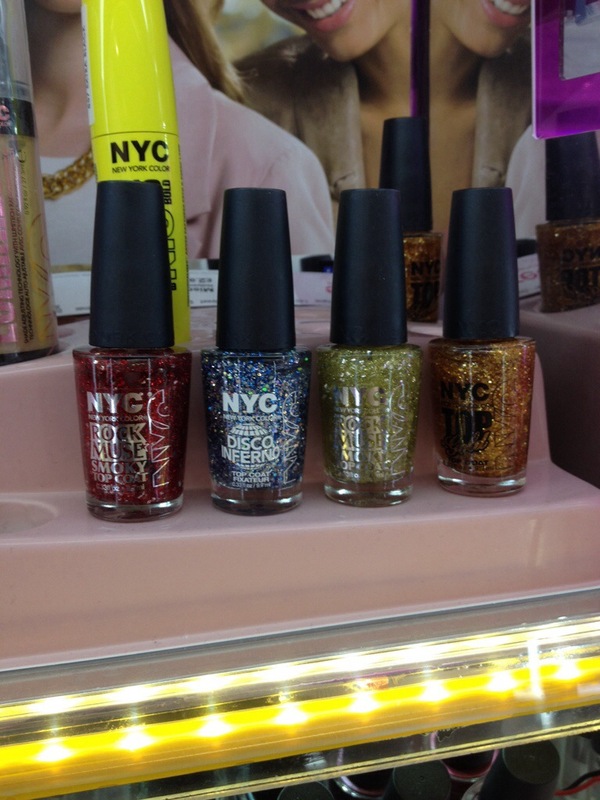 NYC New York Color has updated its glitter range too. 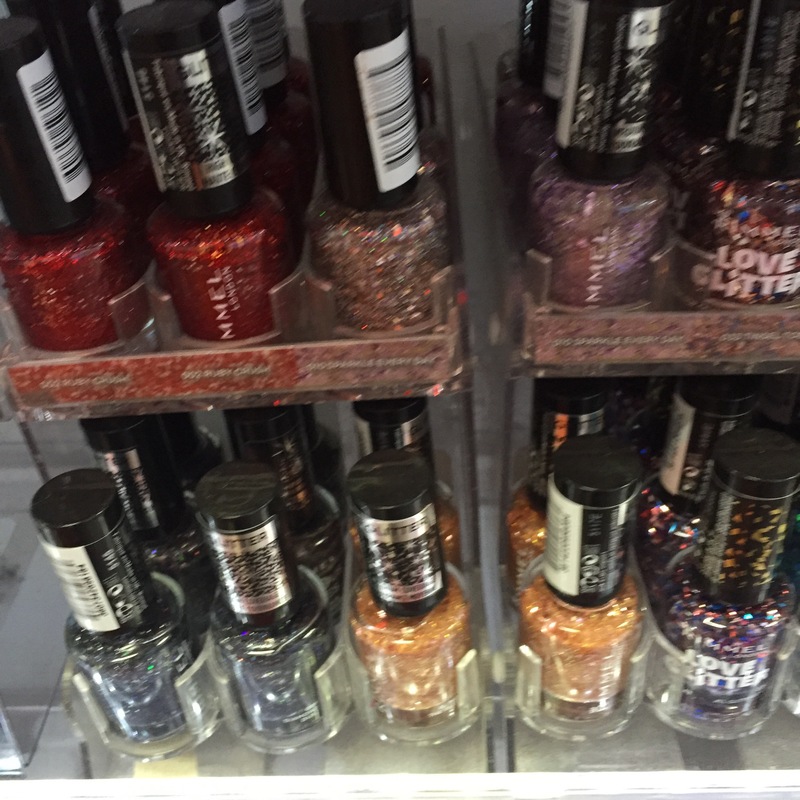 I hadn’t noticed these before, but Disco Inferno has been repacked along side the black and silver Rock Muse polish. I also saw some of the new Bourjois One Seconde shades in the stand but was unable to get a picture as it was surrounded. There are several new shades coming, the collection is called Gold is Back and is numbered 29 to 33. Not yet on the UK site, but images are on the French site. I picked up Dangerous Wish (number 31), swatches to come and that set me back £5.99, but it is stunning! That’s all for this for now, do let me know if you see something new, feel free to tweet me a pic @BakingNails or drop me a comment. I’d love to hear what you have been picking up. Don’t forget that you can follow this blog via Bloglovin’, either by clicking the icon to the right or by clicking here. Items from the fall ranges are now started to creep into the shops. I’ve heard of a few other new lines that I have yet to see, so if you see anything new, please either blog about it yourself and send me a link, drop me an email, or comment below. I love to hear what is coming up your way. 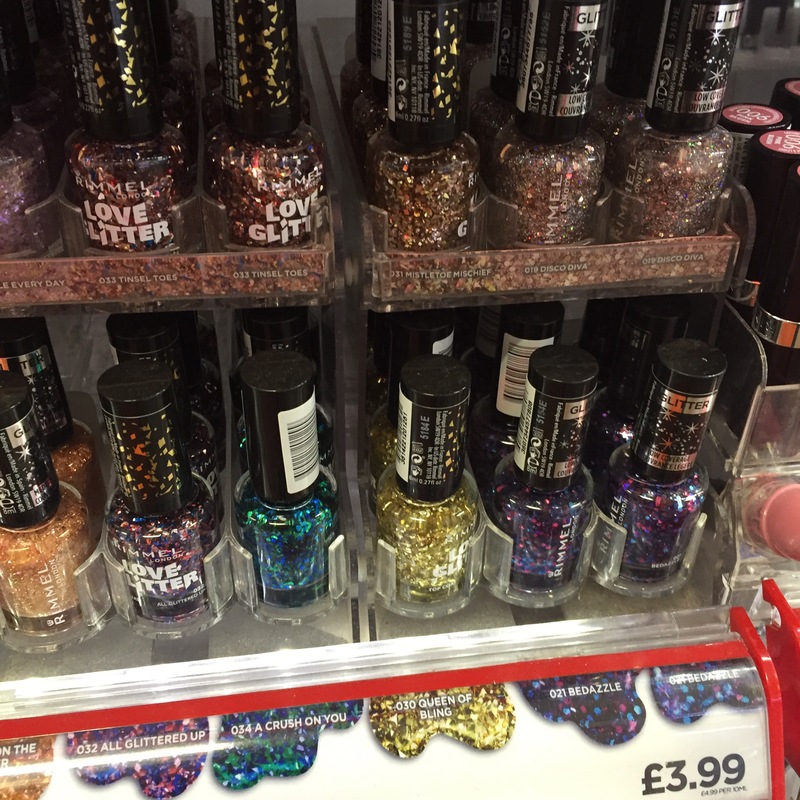 Anyway, todays spot included these new polishes (and a few additional lipsticks) from Rimmel, they are calling them Colour Flip Metal Rush (a bit like Eye Candy London) but they are cute. 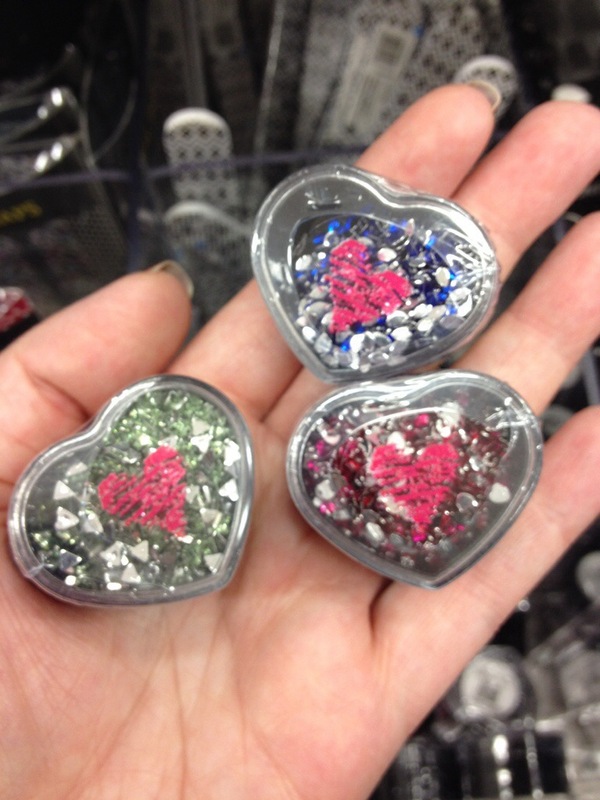 No sign of the forthcoming Precious Stones polish, but I will be keeping an eye out. OK, avert your eye if you don’t like cute things. 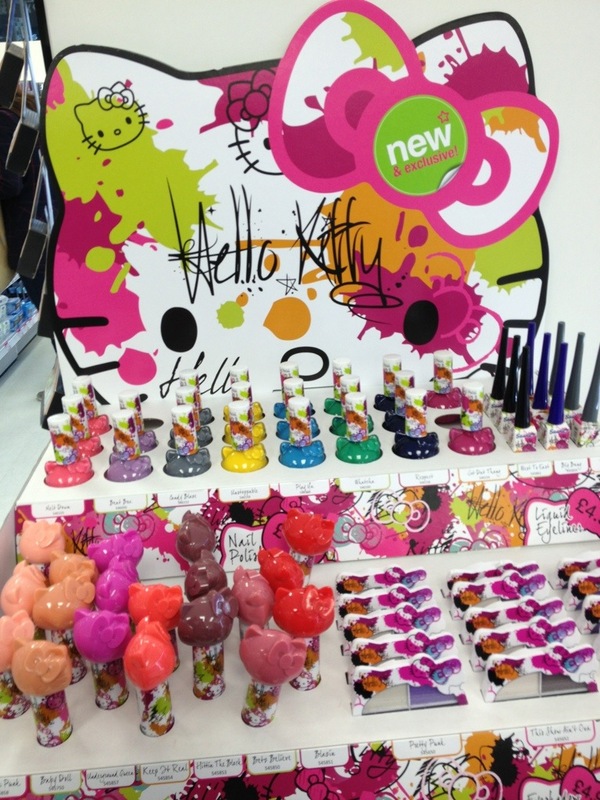 Here is my first sighting of the new Hello Kitty Range in Superdrug. Just look at those bottles!! £4.99 each. A quick jaunt around town in the rain over lunch hour was today’s treat. I did, however, spot some new displays. So without further ado, here they are. 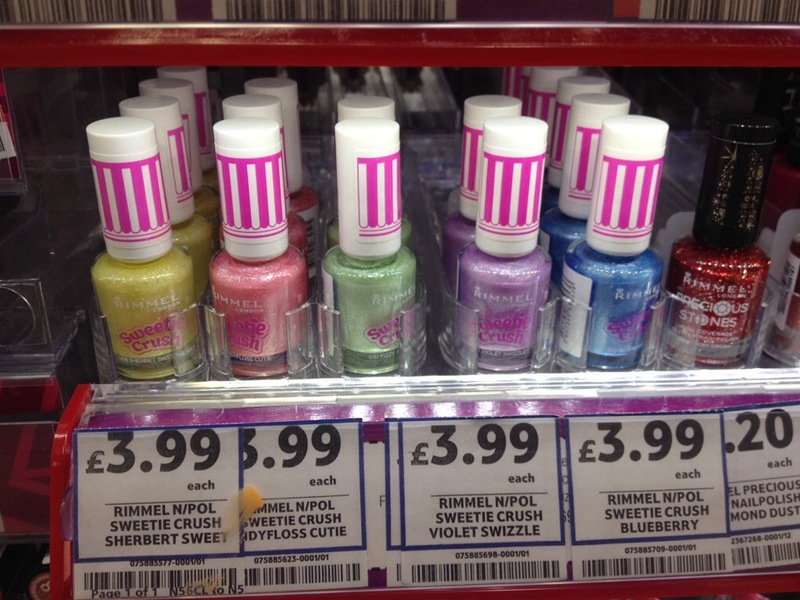 New Maybelline Colours, one in the Express range (the turquoise) and the others in the Forever Strong PRO range. Very pastel. Four new colours in the new Miss Sporty display. 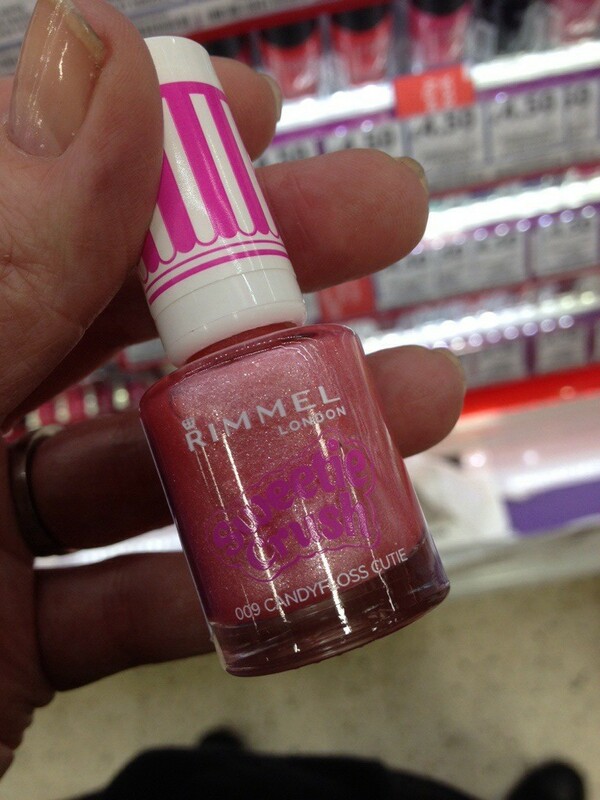 Not as pastel orientated as Maybelline. 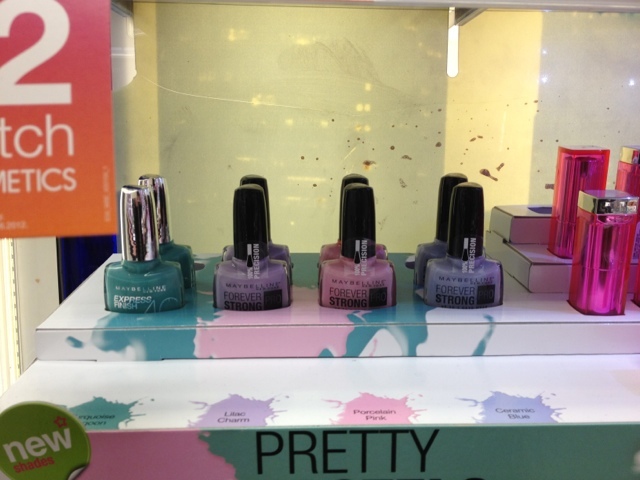 Three new NYC Nail Colours. 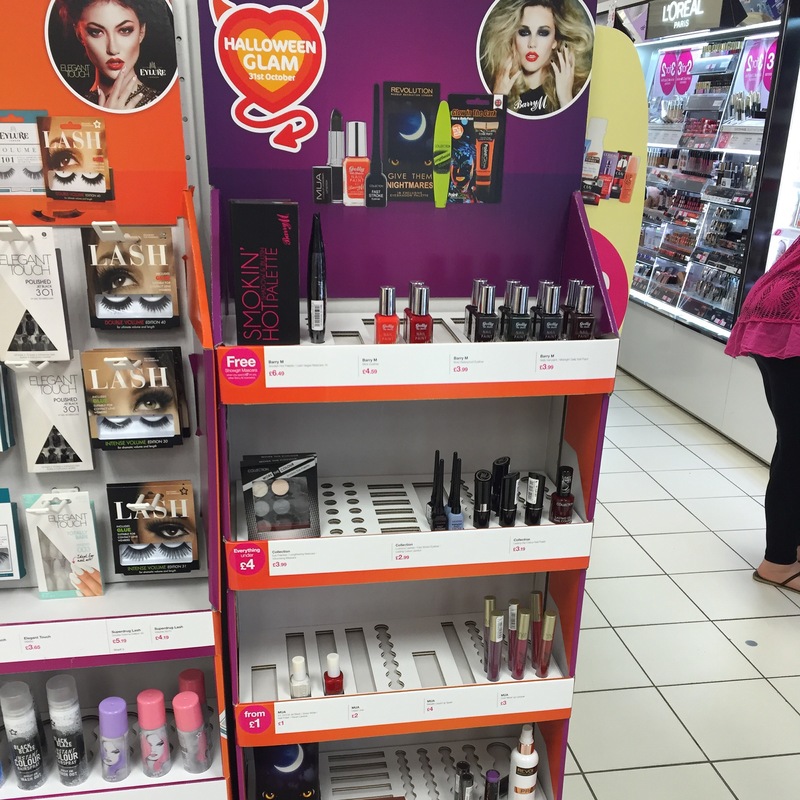 Superdrug is now running a 3 for 2 on all cosmetics in store, run run run! So, what catches your eye?